Copying professional golfers is not a good way to improve. Pro golfers succeed in spite of their golf swing, as you can see in our golf swing analysis videos. Remember--the pros only connect with an average of 62% of their fairways. That means half of them are worse than that. If you copy the pros, you also copy their golf swing faults. You don’t want to swing like the pros—you want to swing better. Eyeballing your golf swing on video is also not a good way to improve. As we show you in our new golf swing video, you can use our simple, straight-forward system of analysis to measure your golf swing. In this way, you can determine what are the worst parts of your swing and work on those first. Many golfers video their golf swing and then work on the parts that are already pretty good, ignoring the faults that are really holding them back. Relying on a teaching pro to ‘analyze’ your golf swing on video is also not a good way to improve. Most pros teach a golf swing that is more than half a century old—a swing that produces poor golf shots and requires thousands of repetitions just to get a minimum of control over the golf ball. 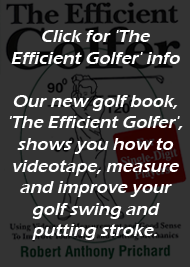 Using the system of analysis and fundamentally new golf swing in our golf swing DVD will enable you to finally get control over your clubs and ball in just a few weeks, without thousands of repetitions. Many of the conventional ideas in golf actually make your golf swing worse. These all destroy your accuracy. The conventional golf swing of today is based on drawings found in a famous book on golf published more than 50 years ago—drawings that have been shown to be highly inaccurate. The modern, conventional golf swing is so unnecessarily complicated that it takes years to master it well enough to play an average round of golf. Our golf swing video shows you how to use your home video camera to quickly and easily video your swing, and then analyze it frame-by-frame. No complicated software to learn or install. You measure directly off your TV or computer screen. If you don’t have a home video camera, we show you an inexpensive camera you can order on line. This camera will shoot video at 240 frames per second, allowing you to examine your swing under a microscope—seeing every little detail. Our step-by-step directions show you how to use the protractor enclosed with your DVD to measure your swing. We also include two record books to help you keep track of your progress. Jonathan Smith is a British PGA Professional. He has been playing golf for 27 years and teaching for 6 years. After teaching for 6 years, he realized that what he really wanted to do was to play on tour. But because he has a family to support, he knew he had to be able to win on tour—not just compete. To do this, he needed to bring his +3 handicap down to a +5. Since he was already had first-hand familiarity with modern teaching methods, he knew that they had nothing more to offer him. So he went on the Internet to search for a better golf swing. He found the Somax golf swing and started to measure and re-fashion his golf swing. Within a month he was hitting dead-straight 300-yard drives. For the first time, he had so much control over his driver that he was able to hit up to 9 drives in a row that all landed within 10 yards of each other at 300 yards out. And this was in the middle of a cold, windy winter—not the best conditions for hitting a golf ball. After he saw what he could do on the range with his new Somax golf swing, he went out to play the front nine on his home course. We tagged along with our video camera, and this is what we saw. After completing his round, Jonathan called us a week later to admit that now he had so much control and accuracy--while at the same time improving his distance--that he now found golf ‘a little boring’. Gone was the drama of not really knowing where his shots would go. Gone was the drama of seeing the unexpected hook, push or slice. Now, with stunning regularity, Jonathan was either hitting or coming close to his target with every swing. We assured Jonathan that the drama of uncertainty would be replaced with the enjoyment of winning. He agreed, and now looks forward to measuring and perfecting his swing even more as he prepares to support his family by winning on the European tour. What if you could go to the best golf swing instructor in the world, at any time, and get the best golf instruction? Your best golf instructor is the one you see in the mirror every morning. This instructor, unlike others, will video, analyze and measure your golf swing any time of day or night. And you won’t have to worry about paying a fee every time you schedule a session. You also won’t have to continue to struggle to keep your drives in the fairway. Because when you learn the Somax system, you won’t be learning a 50 year-old swing that at best is unreliable and at worst takes years to master. With the help of our new DVD and the instructor you see in the mirror, you will make immediate improvements in your accuracy and distance. We all have a mental image of the golf swing. We get it from watching the pros, or looking at the cover drawing of a famous golf instruction book, or seeing it in magazines and on the Internet. The problem is that this golf swing is 50 years old. The image is out of date. We don’t use rotary dial phones, drive cars with tail fins, or fly in airplanes from 50 years ago. Why would you try to copy a 50 year-old golf swing? Why would you spend your hard-earned dollars to pay someone to teach you a 50 year-old swing? If we want to see something from the past, we go to a museum. But we don’t use it as a benchmark for the present. 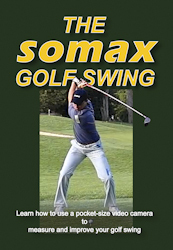 Somax, after working with amateur and professional golfers for decades, has developed the first really modern golf swing. One that is both more reliable and longer than the 50 year-old swing that is popular today. Changing your image of the golf swing is the first step to improving your swing. We expect that when we fly that the airplane was carefully assembled from precisely measured parts. If we were told that the plane was built by ‘feel’, and that the company that built it didn’t see the need to measure anything, we might sensibly choose to fly on another airplane. We also don’t fly on planes, live and work in buildings, or drive cars that were built on ‘opinion’. Even if we build a small tool shed for the back yard, the first thing we do is pull out our tape measure. It’s the same with the golf swing. The modern golf swing is based on opinion, not on measurements. First, is the mistaken idea that ‘feel is real’. What golfers feel is happening in their swing is often completely at odds with what their video shows. The second is that opinion is regarded, by many golfers, as more important than fact. For instance, we saw more than ten years ago that many golf pros and tour players were of the opinion that magnets helped their game. It didn’t matter that there were no measurements or facts to back up that opinion. As a result, the use of magnets in the shoes, on the wrist and in pendants around the neck spread like wildfire on tour. Now—you no longer hear or see any mention of magnets. The opinions of a famous player or teacher are still nothing more than opinion. They are not facts. To improve your golf game, base your instruction on measurement and fact. Unlike golf instructors, who have been taught to teach a 50 year-old swing, we have taken an engineering approach to the golf swing. First, we started with the basic problem. Most people in golf think that the main problem is getting the ball in the hole with the least number of strokes. But this is really the result of what you do during your swing. How do you connect the center of the club face with the ball while the club is travelling at 100 mph and pulling away from you with 100 lbs of force—while at the same time keeping the club face square at impact and the club on plane? It required us to rethink everything about the golf swing. First, we realized that two of the main tenets of the modern golf swing actually made a golfer worse: teeing up in front of your stance and starting your downswing by shifting your hips toward the target. Both of these moves made it unlikely that a golfer could keep his clubface square at impact without years of practice. The third convention of the golf swing—dropping the hands at address—insured that a golfer would have to spend years trying to make contact with the center of the club face. The fourth tenet of the modern golf swing—restricting the backswing—was the cause of many injuries and loss of distance. By spending several years developing a method to measure the golf swing, we were able to identify exactly those problems that led to poor accuracy and consistency-- and reduced distances off the tee and fairways. 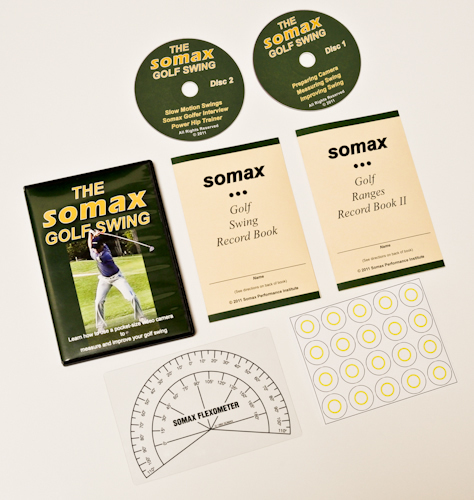 Now we share that system with you in The Somax Golf Swing DVD set. We teach you how to be your best teacher. When you receive The Somax Golf Swing DVD set, the first thing you notice is how much it weighs. It’s not a skimpy DVD in a plastic box like most other golf swing videos. It’s a complete instruction package with two DVD’s, a transparent protractor to measure your alignment, markers to measure your sequence and separation, and two record books to keep track of your measurements. We walk you through the process from A to Z. Many golfers are concerned that it is going to be too difficult or too much trouble to video their golf swing. But it’s easier if someone shows you, step by step, just how to do it. This is what we do in our DVD. We show you which camera and tripod to order if you don’t already have them, where to buy them, and how to set them up. We show you how to get accurate videos of your swing from the front and down the line. Then we introduce you to our RSSSA (pronounced ‘Russia’) system of swing analysis and measurement. Simpler than learning computer software, our system allows you to directly measure on your TV screen the five major elements of the golf swing. Golf swing Range is how many degrees you turn away from the ball. We show you how to measure the range of your club, arms, shoulders and hips. In this way, you can identify where you have range deficits. Once you find out what they are, we show you what you need to do to correct them. Golf swing Sequence is the order in which you move the parts of your body during your downswing. Unfortunately, the modern golf swing actually teaches you a poor sequence that is the major cause of disappointing drives, woods and irons. We show you a more efficient sequence, and how to improve the one you have. Golf swing Separation is the amount of time between each movement. The greater the separation, the more consistent you will be as a player. We show you what you need to do to improve your golf swing separation. Golf swing Speed is the speed of your hips—the major powerhouse or engine of the golf swing. Once you have measured your hip speed, we show you what you have to do to improve it. From years of measuring and improving the golf swing, we have found that the secret to accuracy is a stable spine angle and front spine angle. We show you how to measure these angles at address and impact, and then show you how to improve the stability of your spine and the consistency and accuracy of your golf swing. In addition to learning how to measure your golf swing, you will also learn how to test and measure your strength and flexibility for golf. The results can be surprising. In our experience, most golf swing problems are a result of strength and flexibility deficits—and not a lack of ‘co-ordination’ or ‘concentration’. This is what makes our analysis of the golf swing superior to any other. We show you how to objectively assess your strengths and weaknesses—and then what you have to do to correct those weaknesses. In our golf swing video, we assume you already know how to grip your clubs. If you don’t, then any pro can teach you this, but they can’t teach you how to measure your swing. Once you have mastered the grip, then you can benefit from our system. The other requirement is that you will be able to devote at least three hours a week to analyzing, measuring and improving your swing mechanics, strength and flexibility. We actually have the best record in golf for improving tour players. We have worked with just five tour players. The first won the US Open as a rookie just six weeks after completing our program. Another improved his putting from #113 to #1 on tour after completing our program, and then went on to set a new PGA putting records for lowest number of putts in a tournament. The third quadrupled her tour income. Another increased his longest drive from 316 to 336. The fifth increased his longest drive from 295 to 400. You can see our analysis of current tour players here. Record a golf swing video with your home camcorder, or an inexpensiveone you can buy on line. 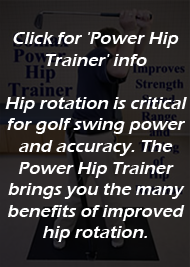 will improve your golf swing that we offer a 30-day money-back guarantee. On the other hand, if you are just curious and want to see what the Somax swing looks like, here it is from the front and down the line. This is one of our golfers who increased his average drive from 290 to 350 and his fairways hit from 62% to 92%. Why spend more time at the range or in the backyard practicing a golf swing that is inefficient? Why not find out what problems there are in your swing, strength and flexibility, fix those problems, and enjoy a more reliable, longer swing? The best way to do this is to order The Somax Golf Swing DVD today. Once you have started working with your new DVD, you will be able to join our exclusive forum for those who are using our system to improve their golf swing. In this forum, you will be able to post questions, read responses to questions, and chat with other golfers who are determined to have the best possible swing for more enjoyable and productive rounds of golf. Plus, we will send out helpful tips each week for the first several months to help you get and stay on track. In this way, you will have Somax and other golfers helping you develop a more powerful, reliable golf swing. If you have questions about our DVD, please call us at 1-800-227-6629. We are happy to answer any questions about our DVD and any of our other programs.